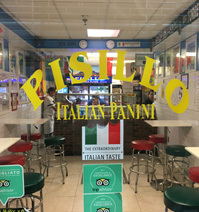 If you haven't tried Pisillo Italian Panini in the Financial District you are missing out. The panini sandwiches served on crispy Italian bread (and not pressed) truly capture the flavors of Italy. They also happen to be huge, which attracts Wall Street workers. We tried the Roma, a panini made with porchetta, smoked mozzarella, roasted peppers and arugula. It's a terrific sandwich. Other offerings include the Parma, with prosciutto do parma, smoked mozzarella, sun-dried tomatos and arugula; Sant'agata piles on mortadella, fresh mozzarella, tomatoes, arugula and EVOO; and the Milano features salami, smoked mozzarella, artichokes and peppers. In all, there are more than 30 different sandwich combinations at Pisillo. Service is fast and friendly.